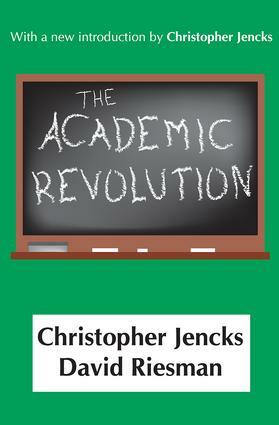 The Academic Revolution describes the rise to power of professional scholars and scientists, first in America's leading universities and now in the larger society as well. Without attempting a full-scale history of American higher education, it outlines a theory about its development and present status. It is illustrated with firsthand observations of a wide variety of colleges and universities the country over-colleges for the rich and colleges for the upwardly mobile; colleges for vocationally oriented men and colleges for intellectually and socially oriented women; colleges for Catholics and colleges for Protestants; colleges for blacks and colleges for rebellious whites. The authors also look at some of the revolution's consequences. They see it as intensifying conflict between young and old, and provoking young people raised in permissive, middle-class homes to attacks on the legitimacy of adult authority. In the process, the revolution subtly transformed the kinds of work to which talented young people aspire, contributing to the decline of entrepreneurship and the rise of professionalism. They conclude that mass higher education, for all its advantages, has had no measurable effect on the rate of social mobility or the degree of equality in American society. Jencks and Riesman are not nostalgic; their description of the nineteenth-century liberal arts colleges is corrosively critical. They maintain that American students know more than ever before, that their teachers are more competent and stimulating than in earlier times, and that the American system of higher education has brought the American people to an unprecedented level of academic competence. But while they regard the academic revolution as having been an historically necessary and progressive step, they argue that, like all revolutions, it can devour its children. For Jencks and Riesman, academic professionalism is an advance over amateur gentility, but they warn of its dangers and limitations: the elitism and arrogance implicit in meritocracy, the myopia that derives from a strictly academic view of human experience and understanding, the complacency that comes from making technical competence an end rather than a means.